3Gstore.com Blog: Pepwave Max BR1 for Verizon on sale for $399 at 3Gstore - limited supply! Pepwave Max BR1 for Verizon on sale for $399 at 3Gstore - limited supply! 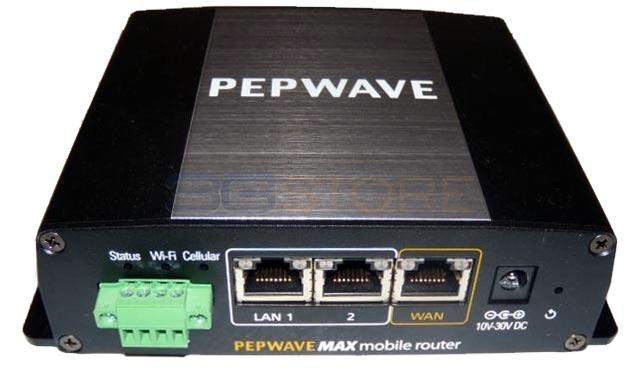 Pepwave's super-popular Max BR1 for Verizon is reaching "end of life" status (Pepwave is replacing it with a multi-carrier version that suppots Verizon as well as a variety of other carriers), but 3Gstore has a limited supply left. While supplies last, customers can buy the Max BR1 for Verizon for just $399 (MSRP is $499) at 3Gstore, AND get free shipping (contiguous 48 states only! This is a great opportunity for users who only require Verizon support to save $100 on this popular router! Automatic WAN Failover: MAX BR1 automatically switches between Ethernet WAN, Wi-Fi as WAN, and 4G LTE/3G links to keep your WAN up and running at all times. Embedded 4G LTE Modem: Cut complexity and cost with a built-in 4G modem that supports Verizon's 4G LTE network. Redundant SIM Slots with Data Overage Protection: The BR1 saves you money with a bandwidth allowance monitor that switches SIMs when you're close to a data cap. Switchable 802.11n Wi-Fi as WAN or AP: Built-in 802.11n Wi-Fi lets you connect to a Wi-Fi source as WAN. Switchable to Wi-Fi AP, the MAX BR1 also lets you deploy a fast, secure, and reliable Wi-Fi hotspot anywhere. Industrial Durability: Built to withstand temperatures from -40° to 65°C and featuring ESD/surge protection for all ports, the MAX BR1 is designed for worry-free performance wherever your work takes you. Versatile Input Voltage. Redundant Power Supply: The MAX BR1 supports a wide input range of 10V - 30V DC. It also keeps the current and your work uninterrupted with a built-in terminal block that can be used in tandem with the BR1’s DC connector to give you high availability power you can depend on. SpeedFusion Persistent Session Roaming: Thanks to persistent session roaming powered by SpeedFusion technology, failover between fixed and mobile links is completely seamless. With other technologies, fixed/mobile failover terminates existing connections, creating costly downtime. with SpeedFusion persistent session roaming, you won't miss a beat when your MAX BR1 switches between connections. Bridge/IP Pass-Through Mode: Bridge/IP pass-through mode transparently passes your cellular public IP to your Ethernet LAN, simplifying your deployments alongside existing equipmenet. Dual Ethernet LAN Ports: Dual Ethernet LAN ports mean you don’t have to worry about external switches and power supplies or unnecessary maintenance and setup hassles, even if your work requires two LAN ports. Central Management: Cloud and local administration options let you manage all your mobile outposts from one intuitive interface. GPS Location Service: Built-in GPS lets you keep tabs on fleet vehicles wherever they may be. Easy to interface with external GPS systems, the MAX BR1 allows you to maximize resources and team coordination while improving safety and productivity. NOTE: a firmware upgrade or unlock key (free) is required to enable GPS. Read more about the Max BR1 and order for just $399 while supplies last!